Our new HD Flat Lashes have a special effect because of the 0.15 mm strength between the single extensions. This look is also known as the Kim Kardashian Look. Because of a completely new manufacturing process the fibers of our flat lashes are pressed, to change their shape from round to concave. 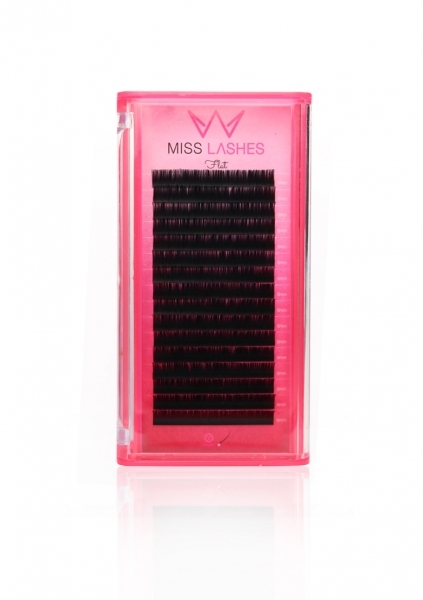 They fit perfectly onto the natural lashes and make the work easier and faster. Also they last longer since the adhesive has more space on the lash to stick on, due to the changed shape of our flat lashes. Flat lashes with a thickness of 0.15 are of then same quality as the volume lashes with 0.07, without decreasing in size. On the contrary, due to the „wide“ shape, they create an irresistible look full of expression and blackness. Flat lashes in 0,20 can be compared to 0,10 lashes.